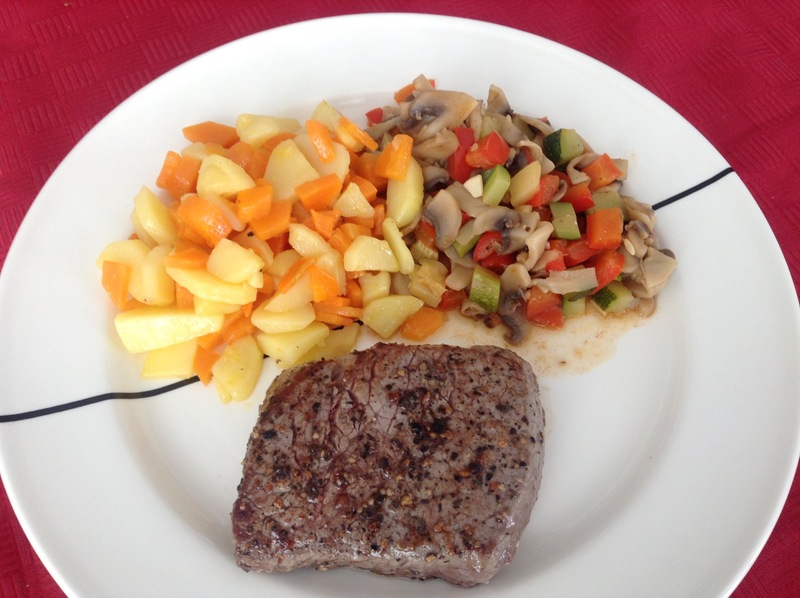 This is an own creation: A tasty steak with a combination of vegetables in two different ways. Peel the potatoes and the carrots and cut them into equal cubes. Cook both in 10 minutes and them put the mixture aside. Meanwhile, chop all the other vegetables. Heat olive oil in a pan and then add first the onions, after a while also the garlic. Next, add the paprika and a few minutes later the champignons. Finally add the tomatoes and the zucchini. Add some spices up to taste (salt, pepper, paprika) and cover the pan. Let the vegetables simmer slowly. Heat the butter in a pan and bake the steak on two sides for 3-4 minutes. Meanwhile preheat the oven to 80°C. Wrap the steak into foil, and put it for 10 minutes in the oven. Add butter again to the steakpan, and bake the potatoes/carrots for 10 minutes in it. Put everything on the dishes and serve immediately.